I bought this book to read as part of the LGBT+ April Read-Along. I had seen it mentioned in a few places as a good LGBTQ YA novel previously, but I didn't know too much about it before people started reviewing it for the month. What I discovered was a seriously beautiful novel. Ari has his problems. He's a loner and he's depressed, but he doesn't quite know why. He's very introverted and keeps to himself. But then he meets Dante at the swimming pool, who is his complete opposite; open and honest generally quite happy and cheery, and quite the intellectual. Where Ari would rather be alone, Dante will speak to anyone. Where Ari has quite a gloomy outlook on life, Dante is light and hopeful, and sees what others often miss. Both have their own problems, but in each other they find the friend they have always needed, and discover just exactly who they are. My review is a little late, but I did have this book finished within the limits of the read-along, on 24th April. What I loved most about this book was the unexpected strength of the friendship between these two boys. They really couldn't be any more different, yet they see something in each other, and they just work. I spent most of the book feeling sorry for Ari, because that boy is so troubled. He is so depressed, and has so much darkness in him that partly seems to come from nowhere, yet also feels like it's due to his rather quiet father, and how the whole family refuses to talk about his older brother who is in prison. Ari really struggles with Dante at some point, wishing he would just leave him alone, but not really wanting him to go anywhere. Ari rarely talks out loud about what he's thinking and feeling, so Dante never really knows what's going on in his head, yet is steadfast and true in his loyalty throughout. There's is a friendship that has some serious obstacles, but one that survives them all. This is an LGBTQ YA novel - which is obvious from all the awards this book has won - but in a way, it's not really the focus. Dante is gay, but we don't discover this until about half way through the book. We only discover it when he announces to Ari that he is in love with him. This puts some strain on their friendship when Ari tells him he doesn't feel the same way, but not as much as you think. It's like an awkward subject, but when they don't talk about it, when Dante doesn't bring it up, all's good and fine. The whole novel is told from Ari's perspective, and aside from the slight awkwardness, the fact that his best friend is in love with him doesn't really faze him - even less does the fact that it's a guy that's attracted to him. Dante is his friend, and despite the wobbles they sometimes have, nothing is going to change that - not Dante's sexuality, not the fact that he is in love with him. And that's the point, the real focus of this story throughout is their beautiful friendship. A friendship that is beautiful because of it's hardships and the ugly moments, and Ari's melancholic view of life that causes him to sometimes shut out Dante and push him away. The friendship is real and raw, and it's strong and it survives. It survives the fights, it survives the awkwardness, it survives Ari's harsh behaviour, it survives Dante's feelings, it even survives distance. And it's all these things together that make their friendship a thing of beauty. Another major theme of the story is family. Each boy has a family that really cares, but there are such problems there even. Ari's father fought in the Vietnam war, and was affected so badly, he's not much of a talker. He doesn't talk much about what he thinks, and even less about how he feels. Ari was born after the war, and so he has never really had the chance to get to know who his father is. There is this great gulf between them, and he just doesn't understand the man at all, because he simply won't open up. And then there's the refusal to talk about Ari's older brother who's in prison. Ari has very few, vague memories of his brother, as he was quite young when he went to prison, but he doesn't really know anything about him either, nor why he's in prison. The family refuse to speak about it. To Ari, it feels like there's something majorly missing from his life without this knowledge of his brother, and it badly affects him. Despite this, the love his mother and father have for him is deep, and they show it in their own ways, even if it isn't in the way Ari wants. With Dante, his parents are young and cool, open and friendly, and they are all so close. Yet he's so worried about coming out to them, that his sexuality will hurt them and disappoint them. It terrifies him. It's really heartbreaking. And yet the love from both families, this strong portrayal of them is just completely wonderful. I had a little trouble with the ending, though. Although it didn't come completely from left field, it was pretty close. The hints about what was to come were very, very subtle, to the point where, although I thought about the possible endings, this is one I discarded as not going to happen. I wasn't expecting it at all. For those who have read the book, you should hopefully understand what I mean when I say I didn't feel it. It seemed rushed and revealed to everyone in the blink of an eye. And not really right. To me at least. I'm sure that's the direction the story was always going to head in, but it didn't feel right to the characters I had come to know. At least not like that. Perhaps several more chapters would have made that ending work for me. I don't know. 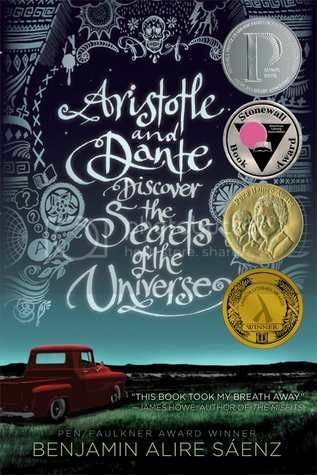 But still, Aristotle and Dante Discover the Secrets of the Universe is such a beautiful, incredible story. I absolutely loved it , and loved how heartwarming it was. Seriously, their friendship is just gorgeous! Quite possibly one of the best LGBTQ YA novels I've ever read. So, so glad I took part in the Read-Along. I've seen this one mentioned over the past month and I'm now really intrigued to read it. Sounds interesting! It's so good! I really loved it, such a beautiful story! Aah, well. Maybe I didn't pick up on as many as you this time round. I saw maybe one or two, but not enough for the ending, in my opinion. Still, it's a fantastic book! I did love it!